On Friday, June 27, seven of Drum Corps International's World Class corps met on the campus of Ball State University for the annual DCI Central Indiana event in Muncie. After the weather caused issues at a number of events earlier this week, clear skies and sun welcomed an enthusiastic crowd to Schuemann Stadium. Carolina Crown delivered the final performance of the night and finished in first place with a score of 76.70, jumping more than three points from the corps' score in Bowling Green on June 22. The South Carolina corps also swept all of the individual scoring captions. 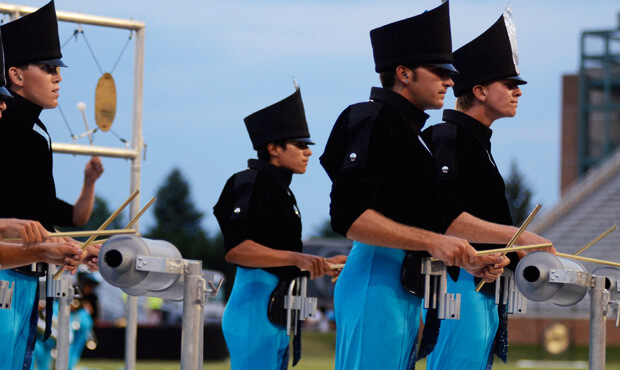 "This week we've gotten to fine tune some things that just don't make a lot of sense yet; places where the ideas are there, but just haven't been performed to their highest potential," Carolina Crown Drum Major Linda Harvey said about the corps' production "Out of This World." "We've spent a lot of time deciding what's working and what needs to be changed." Carolina Crown also spent time this week mentoring marching band students as the official "corps in residence" at Ball State University for the 2014 Music For All Summer Symposium. The corps teamed up with the high schoolers, performing side-by-side on the field as an encore to cap off the competition. "Having the campers here is really exciting because they pump us up for the performance. We've gotten to interact with them all week and that's been very cool," Harvey said. Phantom Regiment earned a second place finish with a score of 73.90 after the corps' performance of "Swan Lake" wowed the audience. The Cavaliers took home third place with a score of by 72.70. Blue Stars received a score of 67.50, putting them in fourth place above the Troopers (5th, 65.60). Despite the 1.4-point gap in overall score, the Troopers outscored the Blue Stars in Visual Analysis by eight tenths of a point. "I thought our performance was very high energy. The crowd gives us a lot to work off, and we just feed off it more and more which really helps us perform," Blue Stars Drum Major Jacob Carpenter said. "As we move down the road we just look into adding more eye candy and more tricks to help us tell the story the best we can." 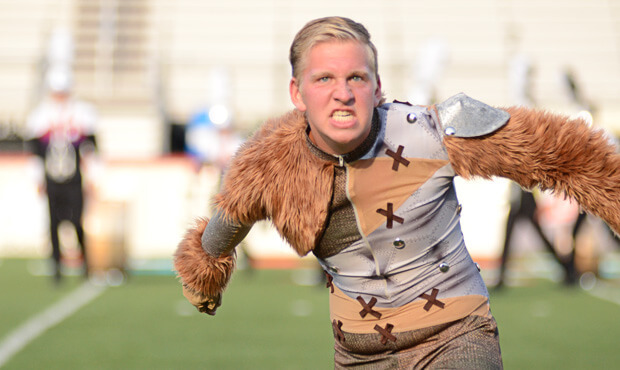 The Colts found themselves in sixth place with a score of 60.50 after their "Wizard of OZ"-inspired performance of "Dark Side of the Rainbow" brought the crowd to its feet. "Our show went really well," Colts Drum Major Jason Shubert said. "Personally I love dark shows, and I think they are more fun to perform. It was a lot of fun playing in front of a crowd who really knows music and appreciates all the hard work that goes into what we're doing." Pioneer finished in seventh place with a score of 52.60. After tonight's performance, Carolina Crown heads to Lawrence, Massachusetts for the East Coast Classic on Sunday, June 29. The other corps will take off in the opposite direction for the annual Drums on Parade event this Saturday, June 28 where they'll meet up again with the Madison Scouts in the Wisconsin corps' hometown. Contributing to this report: Katy Nowak.